I’m a non-traditional student. In grad school for a master’s degree after a few years in business, I was surprised to find that when I returned to school I had to learn how to write a paper all over again! Staring at a blank screen with a 10 or 12 page requirement looming left me, at first, paralyzed- so I began to apply the kind of creative problem solving to this paper writing process that worked so well for me when I launched three .com’s during my business career. During my first 18 months of grad school I found three methods that really helped get the ball rolling when I was faced with a big paper to write but not much idea of what I wanted to write or how I wanted to approach it. The problem was just too big, and I tend to procrastinate big problems, thus I found myself procrastinating some really big papers and turning in work that I wasn’t very proud of. 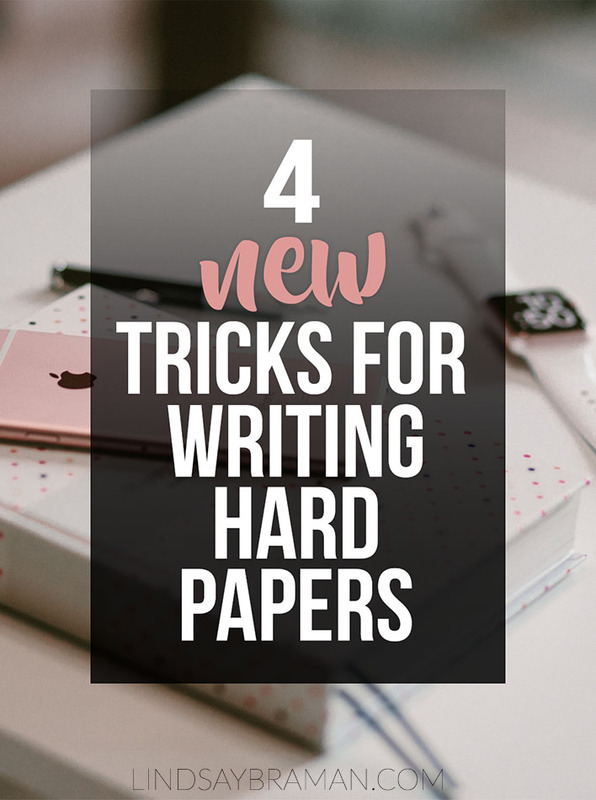 As a result of those early papers and of some trial and error figuring our what worked for me, I found four ways to beat the paper writing procrastination by breaking my early paper-writing process down into small, manageable pieces. Here are my four (well, five-ish) tricks to getting started on a big paper, even when you’re feeling overwhelmed and chased by procrastination in all its sneaky forms. I don’t know where this number came from, but it’s the magic number for me. Think of it like the student version of Kimmy Schmidt’s “You can do anything for 10 seconds”. If Kimmy can turn the mystery crank for 10 seconds, I can do “something productive” towards this paper for 23 minutes. The secret: 23 minutes is a small commitment. I can set my phone and commit to not being distracted or procrastinating for just 23 minutes. 23 feels small. It feels survivable. Try setting your phone for 23 minutes and just attempting one of the methods for starting your paper below, once you’re 23 minutes in, you might just find your mojo to keep working. In either case, you’ll be 23 minutes closer to finishing. My best papers emerge visually. Often I’ve thought about what I want to write but don’t really know what’s important or where my thoughts are concentrated. Tip 2: ditch the keyboard for a piece of paper and a nice juicy pen. If your ideas feel extra chaotic, grab a marker and and extra large piece of posterboard and just begin spilling any thoughts that are even loosely connected to the topic of your paper onto the page. I’ve written about mind-mapping for paper outlines before, but the main goal when you are at this place, stuck at the very start of a peper, is to use the mind map as a way to figure out what IS in your brain around the topic you are assigned to write about. For this mind map there are no bad ideas. Begin by writing your teacher’s writing prompt in a box in the middle, then begin adding boxes of your thoughts. Critical ideas are welcome on the page, as are voices from teachers or authors other than yourself (just mark them with a star or special color so you’ll know to cite them later). As you add words and encircle them with bubbles, draw lines to connect each bubble to bubbles containing related words or ideas. As you fill your page and connect bubbles, you’ll probably start to see bubbles with lots and lots of connecting lines and bubbles with very few connections. Read over your map and highlight bubbles with lots of connections- could these be your main points? And if you have several main points, could they together form a thesis statement? Locating main points and a thesis means you are well on your way to finished paper. 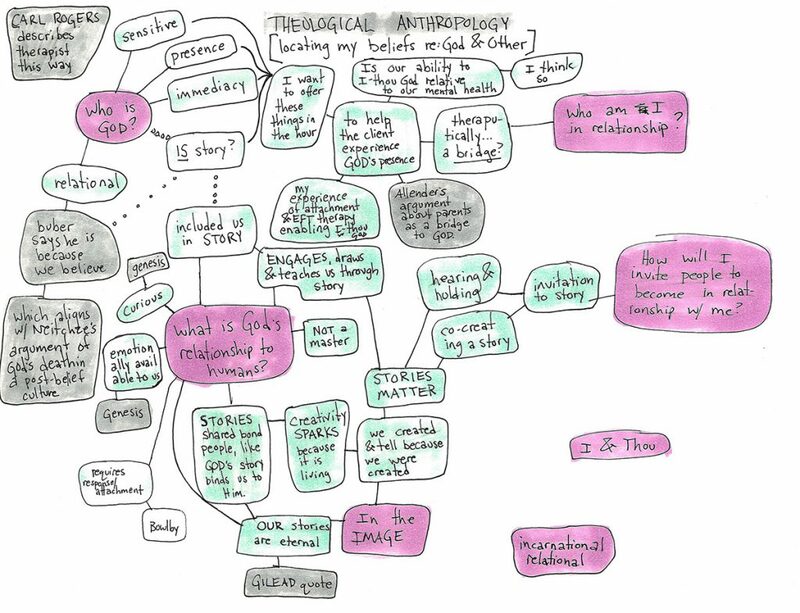 A mind map I did to located my thoughts about a difficult writing prompt in my second term of grad school. One version of procrastination is the voice that convinces you to delay starting because you have too many ideas. Sometimes you may have many swirling thoughts about a topic in response to a writing assignment prompt, but it’s difficult to make sense, find themes, or create a structure from your thoughts. Cutting a first draft apart paragraphy by paragraph can be a helpful way to organize into an outline a chaotic first draft. 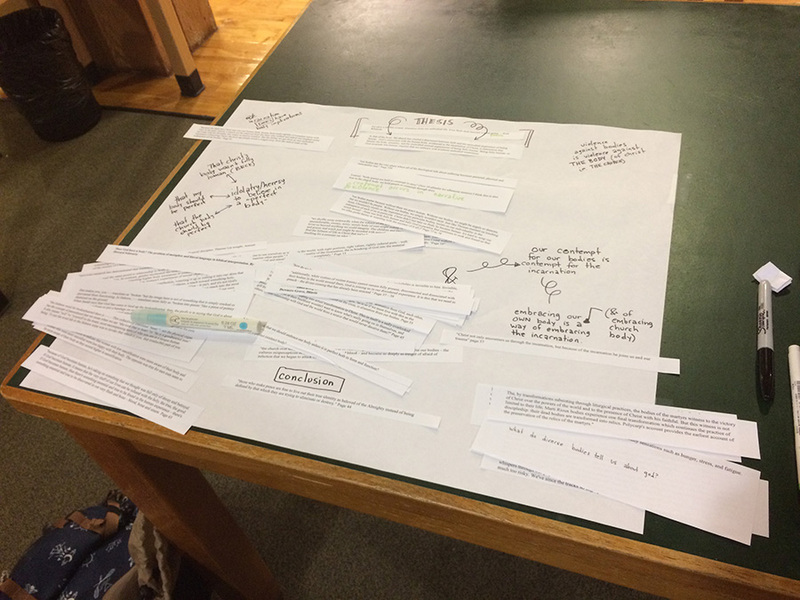 Print your “brain dump” document and cut it apart paragraph by paragraph (a school library papercutter makes this quick work). Sit down with glue and a large piece of paper (I use the glue pen I keep in my bag and Post-It Easel Pads) and begin to very visually and quite literally move my paragraphs around until they form an outline with main points and flow from paragraph to paragraph. When the structure of my paper begins to take form I start to glue down my paragraphs in the order I’ve arranges and use a pen or marker to add transitions where needed and add prompts for missing paragraphs. Once rearranged on paper where I can see the essay start to finish in one place, I make these changes to my word document and find, as I do so, I’m typically 80% of the way to calling the paper finished! When you absolutely can’t get started on a paper and believe you have no thoughts to share on the topic, you can still get a start on your paper by using quotes from sources as a crutch to get you started. As someone who hates transcribing and learns well via auditory learning, voice dictation software has been a godsend for me in my life as a student- especially when transcribing quotes for research papers. Once set up with this method, you can read quotes out loud from a comfortable chair and your computer will transcribe them into written form. Not only does transcribing quotes help add length to my draft (thus adding steam to my paper writing process), but also the process of reading aloud quotes from my sources, and hearing myself read those quotes, usually helps me understand the information on a deeper level and often spurs me on to add my own ideas verbally as I am dictating the author’s quotes. As I finish dictating quotes, I often find paper writing material in creating a conversation between the quotes and the thoughts I dictated while dictating the written quotes. To get good results voice dictating, you’ll need to invest a little. Dragon NaturallySpeaking is the industry leading voice dictation software, but don’t pair it with a cheap mic and expect accurate dictation. After trying and returning a $15 mic, reviews led me to this $60 conference mic with a 20′ range that I’m thrilled with. I can crash on my bed with a book and read to this mic from across the room, and watch accurate transcription appear on my screen.